Writer Rachel is a travel addict who aims to visit every continent in the next five years; her favourite places so far are Sikkim, India and Jinja, Uganda. When she’s not travelling she keeps a lifestyle blog over at http://alittlegrey.co.uk. Jagged volcanic cliffs plunge into the turquoise Mediterranean Sea, whitewashed buildings, blue-domed churches and ancient ruins make up the island’s stunning architecture, while black and red volcanic pebble beaches sit secluded between rock formations. 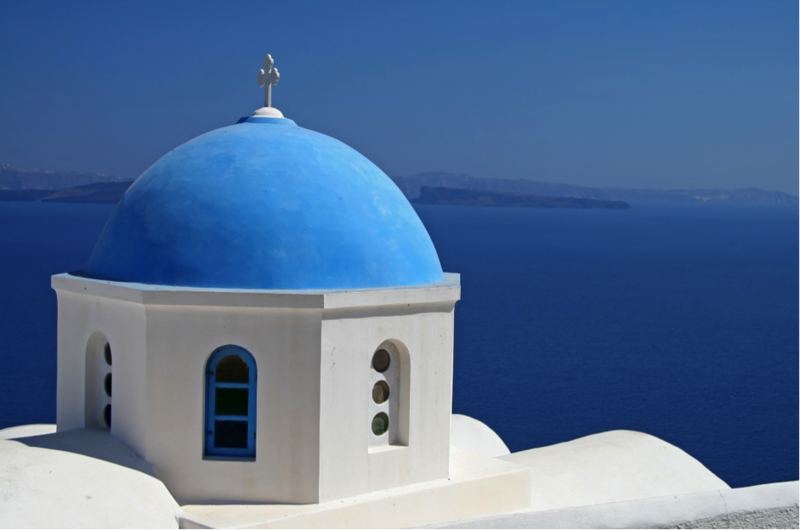 It’s easy to see why Santorini is considered the jewel in the Greek islands’ crown. 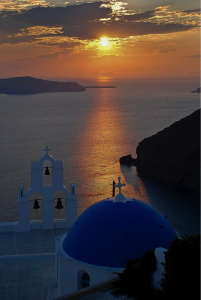 Santorini experiences some of the most breath-taking sunsets on earth, and while the Oia Castle is the island’s most famous venue for sunset-seekers, it’s worth seeking out some of the even more secluded and romantic spots. 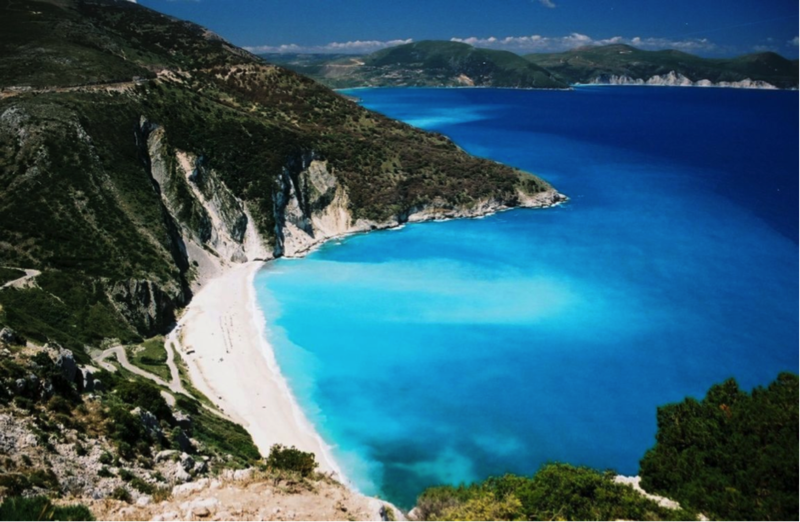 So make your way to Pyrgos, one of the highest spots on the island or Vlihada beach, where the setting sun casts strange shadows over the volcanic rock formations. Or if you really want to get away from it all, take a trip out to the lighthouse at Faros. Santorini has some breath-taking beaches, some of which are best reached by boat – for instance, the secluded white beaches flanked by chalk-white cliffs and the red beaches with their volcanic red rock backdrops. Alternatively, the resorts at Kamari and Perissa provide sunbeds, umbrellas and watersports centres where you can learn to windsurf or water ski, and have lively promenades packed with shops, bars and cafes. 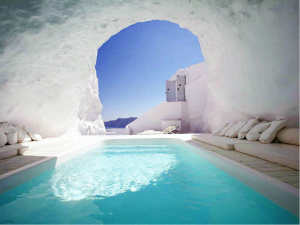 Santorini has a network of cave houses – known locally as Yposkafo – that were originally built by locals to protect themselves against the high coastal winds but have now been converted into luxury accommodation. It’s an experience quite like no other, living in close, cramped quarters, with the characteristic smells of the volcanic rock and the close proximity to the caldera – the rim of the volcano that formed the island. Santorini has been making its own wine since the days of the Roman Empire and it’s still one of the main local products and exports. The volcanic explosion has left the soil, known as ‘aspa’, with little or no organic matter, but rich in essential minerals, which creates wine with a naturally low pH level and high acidity. Check it out for yourself by booking on a tour and sampling the local wines. Ancient Thira is sat on top of Mesa Vouna, a vast rock formation that separates the beaches of Perissa and Kamari, and is home to a breathtaking collection of ruins that date from the Roman, Hellenistic and Byzantine periods. The nearby village of Emporio overlooks the beaches of Perissa, and Perivolos is also a must-see destination to witness its well-preserved ancient Kastelli (castle), historic churches and architecture. To do Greece without checking out the local cuisine is to do Greece all wrong – it’s home to some of the most stunning and unique dishes the Mediterranean has to offer. 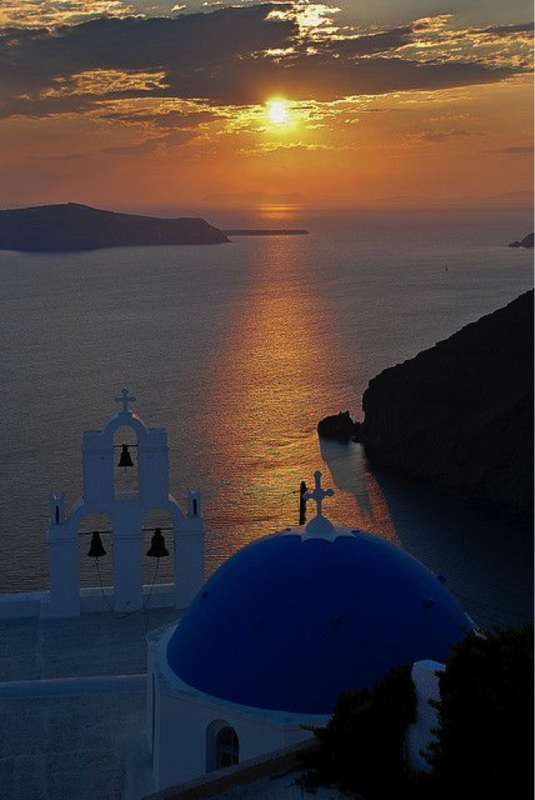 And Santorini has arguably some of the finest cuisine on offer in the Aegean. The Selene restaurant in the beautiful village of Pyrgos places an emphasis on local produce and innovative cooking techniques and offers some of the island’s best cuisine – but such is the love of food in this area, try out the local restaurants for a genuinely-breathtaking, Greek gastronomic experience.